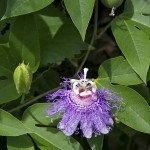 Companion planting for passion fruit and how to prune. As far as companion plants, are you looking for something that will grow at the base, or a vine that will grow among the passion vine? Let me know and I can better advise.